This story is re-posted from CSUN Today. Read the story and see more photos in CSUN Today. 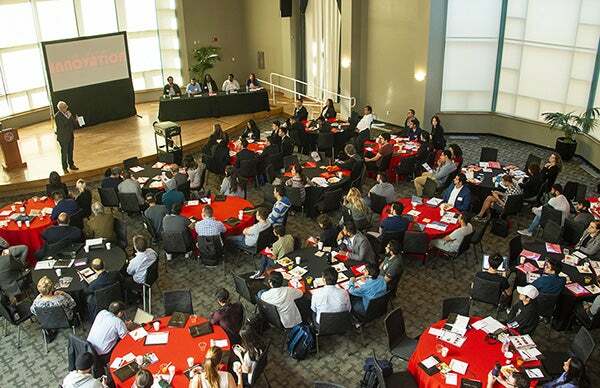 On November 2, CSUN hosted its fifth semi-annual Art of Innovation Conference in collaboration with the College of Engineering and Computer Science, the David Nazarian College of Business and Economics, and the College of Health and Human Development. Among a variety of innovations discussed, Health Administration faculty Sal Esparza led a panel on Telemedicine--a way to provide healthcare anywhere, reducing the necessity to go to the doctor’s office. Esparza posed questions to panelists Hadley Washburne, regional manager of strategy at Providence St. Joseph Health; Thomas Chan, assistant professor of psychology at CSUN; and Kara Snow, director of patient care experience at Kaiser Permanente and our own Lou Rubino, CSUN Health Sciences department chair. Executive and innovator Dale Deardorff ’84 (Art), M.A. ’87 (Two-Dimensional Art), M.S. ’93 (Industrial Engineering) introduced a panel of CSUN alumni who discussed big data, AI and machine learning. The panel included Kimberly Sanders ’95, director of global TV distribution at NBCUniversal; Subash D’Souza, director of data and operations at Warner Brothers; Elena Bolbolian ’05 (Public Administration), civic innovator for the City of Glendale; Seyed Sajjadi ’18 (Computer Engineering), a systems engineer at NASA; and Sina Talebian ’14 (Engineering Management), a data scientist at Versus Analytics. Another panel discussed the topic of telemedicine, which is the use of telecommunication to provide healthcare anywhere, removing the necessity to go to the doctor’s office. Telecommunication enables services such as in-home medical devices, virtual consults, chatbots to answer questions, and interactive education, aiming to streamline care by making it more convenient for patients. In addition, medical apps are offering digital cardiac monitoring, diabetic monitoring, and exercise and diet plans for patients to monitor and improve their health. "A team of students from UCLA Anderson, including panelist Hadley Washburne, are working on a startup offering monitors that allow at-home ear-infection checkups for children (administered by parents and guardians)." This story is re-posted from CSUN Today and highlights the role of HHD in the event. Read the story and see more photos in CSUN Today.